WOULD YOU DONATE YOUR RACE GADGET ? Skylakes was born to bring in the smallest country of Veneto, Laghi (Vicenza), a mountain running, to letting us experience trail running through the values and emotions that this sport and environment can give us. We have always tried to organize the event and everything that goes around it with a lot of passion. Run, with a great heart. We would like to go beyond all this; we would like to help those who have less, those who need, those in difficulty. 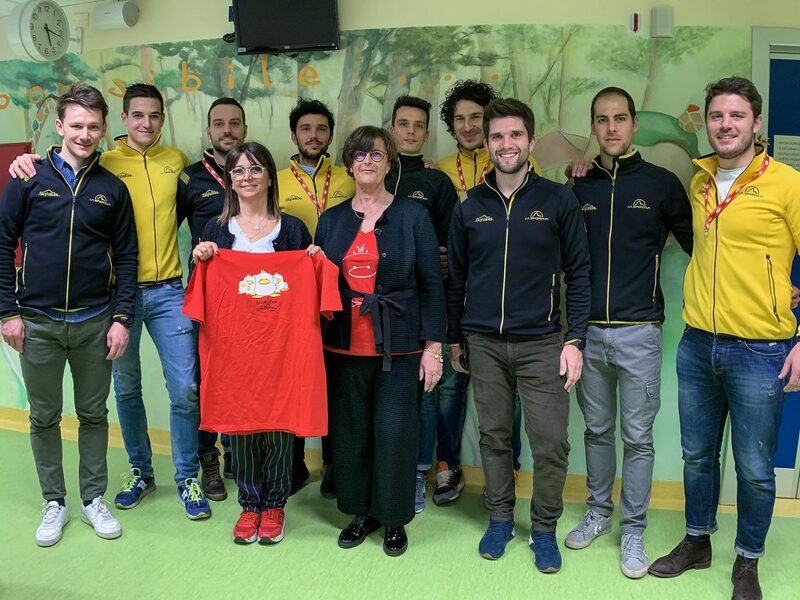 We propose to all those who participate to decide whether to request the gadget, a Skylakes t-shirt or to donate the corresponding cash value to TEAM FOR CHILDREN ONLUS of VICENZA – Italy (www.teamforchildrenvicenza.it). If you wish, you can request both the t-shirt and make a donation. We met Anna and Coralba, who started in 2014 with a dream come true from the union of many families and volunteers who offer time, commitment and enthusiasm, dedicating themselves to the Pediatrics department, the Oncohematology Day hospital and the neonatal intensive therapy. A support to the children and their families that we of Skylakes have embraced and that thanks to all of you we would like to spread and increase. Registration for 20 € for the first 300 subscribers, from 01 March 2019. In the price of the single registration, A.S.D. Skylakes includes the signing of an athlete personal insurance cover, FISKY, valid only for the day of 23 June 2019. It is possible to subscribe ON LINE with a credit card or bank transfer, through the official website www.endu.net the appropriate subscription form. Registration will be automatically registered. Registrations will open at 12.00 on Thursday, March 1, 2019 and will close at 12.00 on Friday 14 June 2019 or until the bibs run out. It will be possible to register at the competition office on 23rd June 2019 from 7.00 (subject to availability of bib numbers). We remind you that registration is effective only after payment of the fee that must take place within 7 days from registration. After 7 days, unregistered registrations will be canceled. The race is open to all persons, men and women, who are 18 years old on the date of the race, with a sports medical certificate for the competitive activity valid at the date of the race and recognized by the nation of residence, regardless of their membership in clubs or sports federations. The organization will strictly check this requirement at the time of withdrawal of the race number, which if not respected will lead to the exclusion from the race and the loss of the registration fee paid. The registration will be considered valid only upon receipt of the registration fee. Copy of the medical certificate attesting to the suitability for competitive practice, issued by the sports medicine doctor and valid at the date of the competition must be sent via email to veneto@mysdam.net or delivered to the race office upon collection of the bib number (in paper format) . Once payment has been made, the registration fee will not be reimbursed for any reason. The replacement of a competitor already registered will only be possible through the website www.endu.net, at the additional cost of 10 euros, until Friday 14 June 2019. Beyond this date no further replacement will be possible. Pectoral training is scheduled at the Campi Sportivi area on 23 June 2019 and at the times indicated in the program. An identification document will be required upon collection of the bib. * Please note that registration is effective only after payment of the fee that must take place within 7 days of enrollment. After 7 days, unregistered registrations will be canceled.